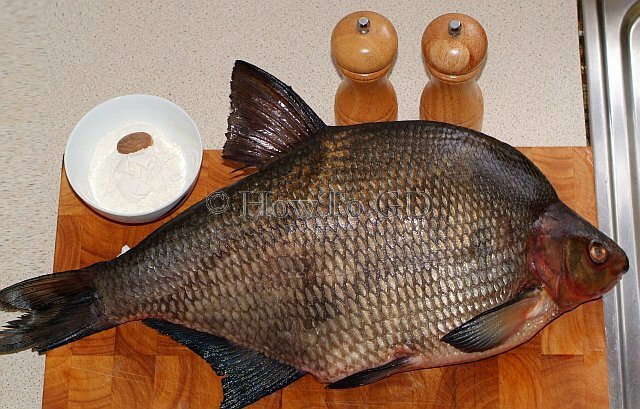 Fresh water bream is a very good example of real fresh water fish with very special taste and aroma, which are specific for such king of fishes. 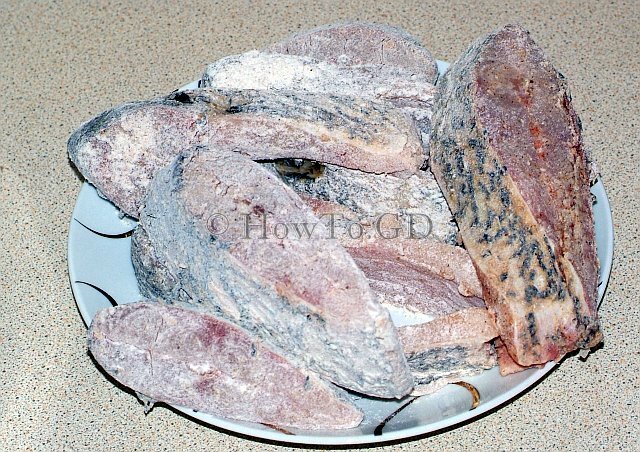 Many people hate this earthy, swampy aroma, but many people are like this characters of the fish meat. Fresh water bream is not a frequent visitor of British fish markets, but occasionally it is possible to find it for sale. 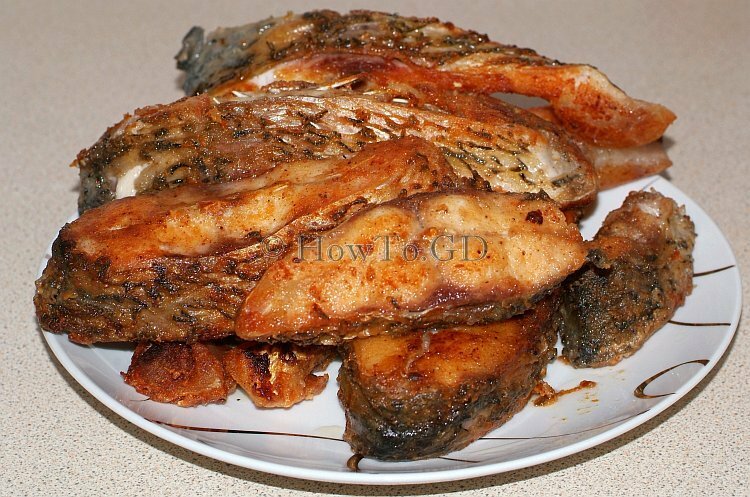 In this article I will tell, how to fry bream by the simplest way. 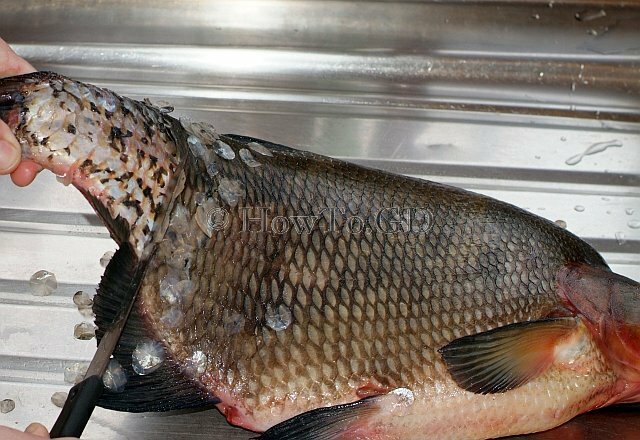 The fresh water bream have another disadvantage, its bones, which either can be burned in smaller fishes, either quite big and easy to handle in the larger spices. Fresh water Bream. This lovely bream on the picture proximately weighted 2 kg. ½ cup of simple flour. Oil for cooking. 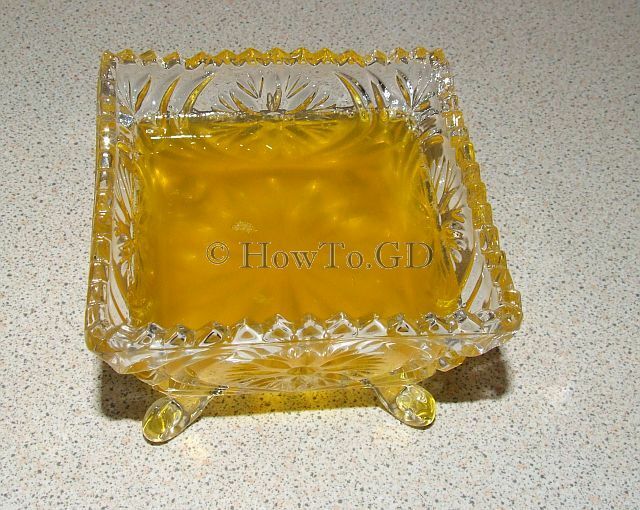 I usually use 1 tbsp of clarified butter and a tbsp of vegetable oil. 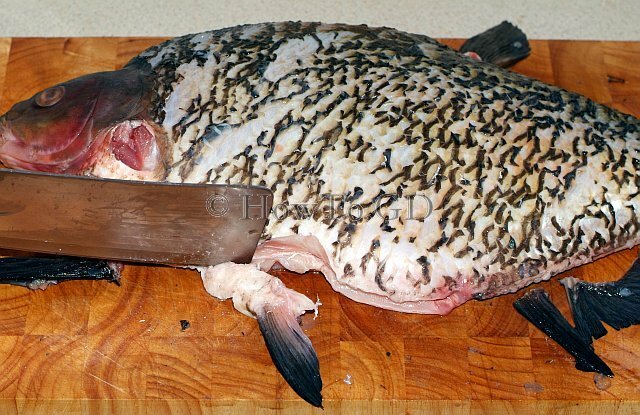 Descale bream by scrapping it with knife from its tail towards the head. Scales firmly attached to the body, and this procedure required some force to be applied. Clean the stomach, remove all its content. 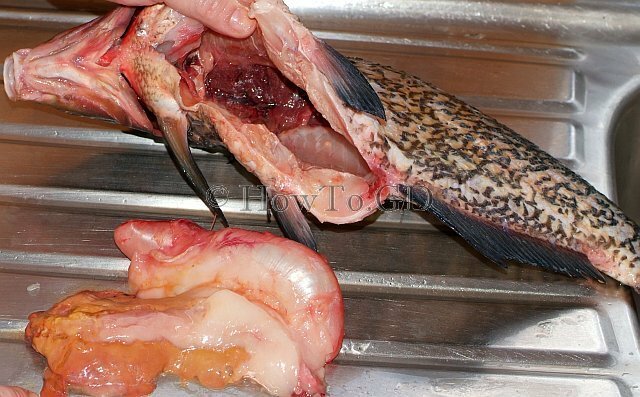 Chop off all fins from the bream body. 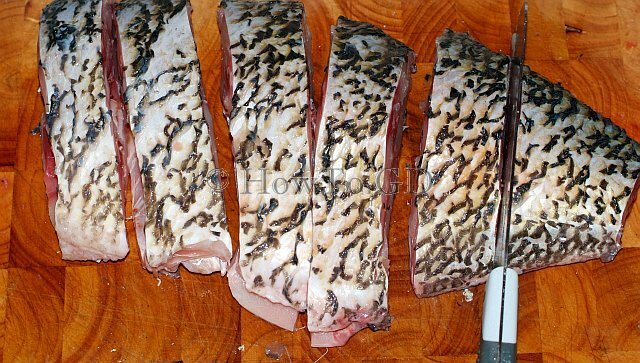 Slice fish body into a steaks approximately 1½ inch thick. The spinal bone is very solid, so it is necessary to use large cleaver, and sometimes use a mallet. 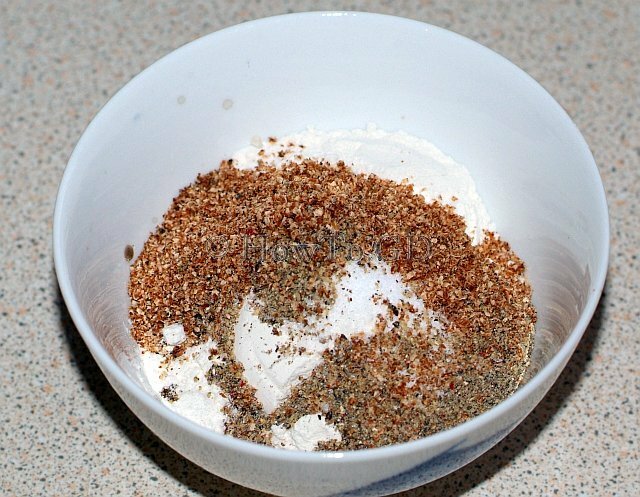 Grate nutmegs into flour, add salt and black pepper, mix them together. Dist all fish pieces with this salted flour. The simplest way to do it: add all flour into a plastic bag, place fish slices inside this bag and shake it for 10 seconds. Melt oil and clarified butter on the pan. 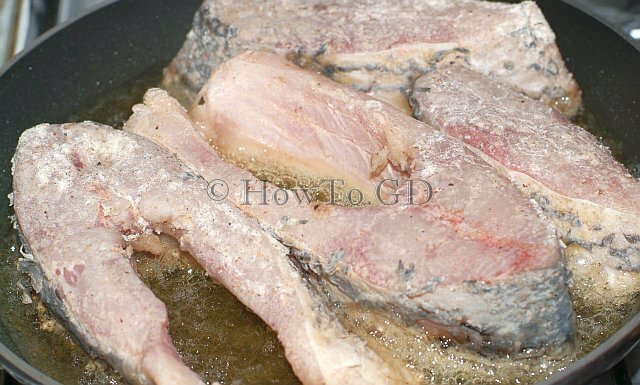 Fry fish from each side until it will be cooked through to a 75 ° C.
Do not use standard butter for frying – it will easily burned. When eating, be extra careful to avoid all bones, good luck! When you fry your fish, be sure to cook it well through to avoid any inventions, spreading through fresh water fishes. If the fish during frying is burning on the surface, but still raw inside – add some hot water to frying pan.